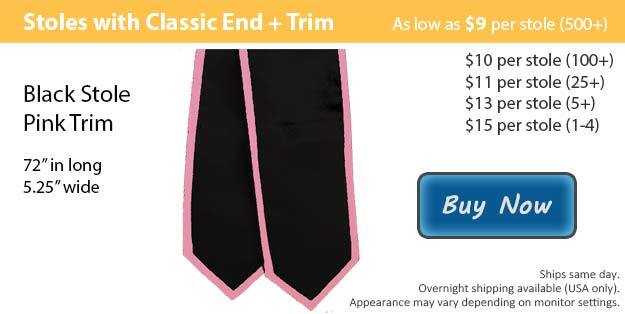 Our stole in black with pink trim is a fabulous choice! The pink goes fantastic with the black, the darker black allows the pink to pop and shine showing its true beauty for the perfect finishing touch on your wardrobe. Graduation is right around the corner, and here at Honors Graduation we can help you to be 100% prepared for this truly unforgettable day in your life. We know just how hard it is to successfully reach your goal of graduation, and thanks to all the time and energy that you have dedicated to get here, it's all about to be worth it. Your friends and family will all be there to join you in celebration as you walk across that stage and accept your degree or diploma, so it is very important to look the best that you can. At Honors Graduation we have everything from cap and gown sets to the accessories that you need to compliment them, and much more. The graduation stoles that we carry can be a perfect way to add some character to your graduation outfit. Our graduation stoles are available in a large variety of colors, mix and match to make your perfect stole. At Honors Graduation you can add your own graphics and/or the wording of your choice to your graduation stole to make it totally unique or to symbolize your position in the group or club that you are in. We use embroidery with the thread color you select to create your custom graduation stole. In addition to all the various color options we have to choose from, we also have two different stole cut options to pick from as well. There is our angled cut or we have the classic choice, both of which can also be purchased with no trim if you prefer a solid colored stole.